You can learn about sublimation from videos, articles on the Internet, blogs like this one, webinars and plain old trial and error, but one of the best ways to learn is via a hands on demonstration. Seeing and touching the equipment and supplies while speaking with people who are expert in using that equipment and those supplies can be very helpful. Since EnMart will be exhibiting at ISS Atlanta this week, I thought this would be an opportune time to discuss what that experience is like when you visit our booth at a trade show. First of all, depending on the size of the booth, we will have a variety of printers on display and a heat press as well. 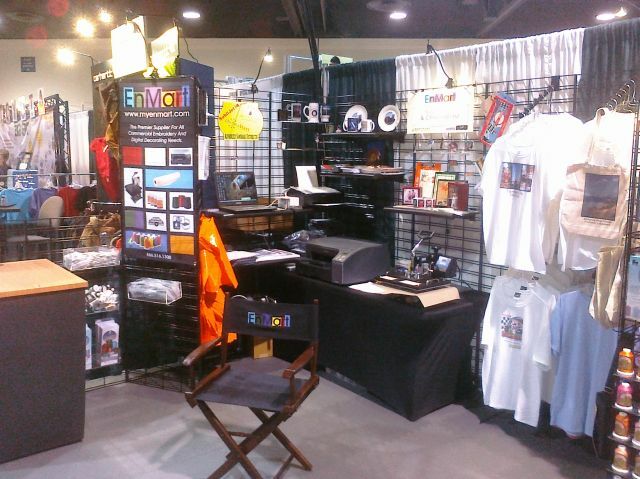 Booth size does tend to expand or restrict the number of printers or the size of the heat press we bring, but we will almost always have at least one printer and one heat press in the booth. The advantage to this is that you can see transfers printed and pressed in front of you as you stand in the booth. This allows you to get an accurate and real time picture of how the printer prints and how the transfers press. Second, we display a variety of sublimated items in the booth. There is a truly bewildering array of items that can be sublimated, and sometimes it is hard to know which ones will work best for your business. Being able to see and touch the items on display will let you get a sense of what might work for you. It will also allow you to discover items that you may not have considered offering in your shop in the past. Generally we get at least one person every show who says “I didn’t know you could sublimate that!” when they first sight a jigsaw puzzle or a bookmark or a tote bag. Visiting our booth gives you a greater awareness of what can be done with sublimation. Third, visiting our booth allows you to talk with our sublimation experts. Tom Chambers, who heads up our sublimation program, and the rest of our sales and booth staff are very knowledgeable about sublimation and can help guide you to the system that will work best for your business. Everyone who works our booth has at least an intermediate level understanding of the sublimation process and how it applies in a business setting. We know the questions to ask, and we also have the answers for the questions you have. Talking face to face in a trade show setting allows everyone to gather the information necessary for you to feel secure in your purchase and for us to know we’ve sent you home with the equipment and supplies that you need. As I said at the top of this piece, there are a lot of ways you can learn about sublimation. If you’re going to be at ISS Atlanta this weekend, or if you will be at any of the trade shows where EnMart will be exhibiting in 2011, I hope you’ll stop by our booth and see what you can learn.